It was rumoured to be the end. The man, who had politicised an iron-clad wall around his position at the helm of Irish football, looked snookered and finally out-maneuvered. One too many rules-twisted, a victim of his own over-confidence, bred by the unwillingness of anyone ballsy enough to take him on; football ‘men’ well aware of those fallen before them: speak out, and the noose on funding is tightened - journalists, armed (like us all) with enough whispered stories to incriminate a small country, understandably, never putting pen to paper, and all relegated to mere reporters of facts; for dare speculate, cast opinion, rattle the cage, or read between the lines with Delaney, and you better be prepared for the mitigation wolves. But if history has thought us anything, it’s that no matter how hot the fire, John Delaney will prosper. A man-master at deflecting and putting himself one-degree of separation away from the blame – rebrand exercise (“agency”), hiring of managers (“independent panel”), Vantage ticket disgrace (“agency”, “economic crash”), finances (“Fran will speak to them”), failures to recruit Rice, Kelly, Grealish (dismantles British scouting system), League of Ireland challenges (creation of a joint venture to take over responsibility), captured singing pro-Republican song, Joe McDonnell, in a pub (“it was some other guy”) – the list is exhaustive. We were but fools to dream that this would be different. Five minutes into the Gibraltar clash, it was clear that any form of distraction from the football would be a welcome one, as the Victoria Stadium proved to deliver no pleasure beyond those with an aviation interest. 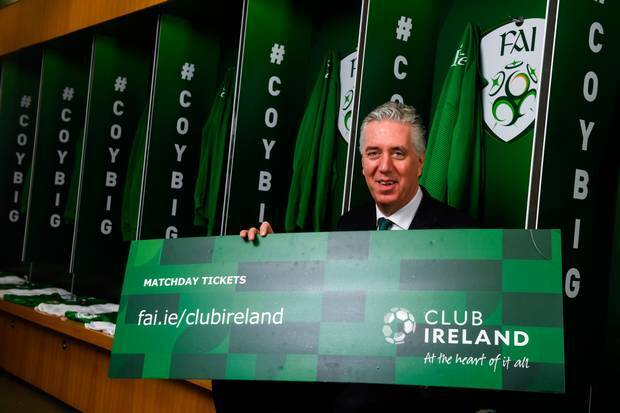 A flag in the Irish section, made from what looked like a local hotel bedsheet – “Delaney Godfather Of Greed” – was perhaps the first sign that the FAI employees present had more pressing matters to concern themselves with. Then the cryptic messages from some journalists started, and by half-time, it was clear something big was unfolding. Football took a back seat, and save for a British Airways plane landing on the halfway line, no one’s focus was returning to pitch-side. Reality ensued, and the toxicity of our history hit with a bang of nauseating anxiety. He was one step ahead, wasn’t he? We, the fans, those who had been treated as fools for so long, weren’t actually winning anything. Why would Delaney ‘resign’? It made no sense. In fact, this was all going to be another Delaney PR spectacle – except this time, it was even more masterful – he was about to get everything he wanted, whilst making us feel like it was us who’d won – the boy who cried wolf, cried again, louder than ever before – and the country went running. The anxiety was crushing. And before our post-match pints had even settled, we were introduced to the new Executive Vice President of the FAI. 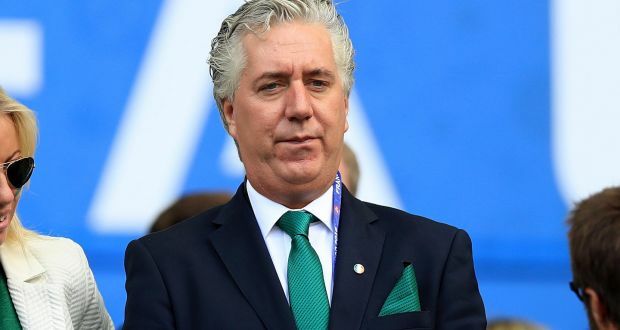 The role of CEO of the FAI has worked wonders for brand John Delaney. Aside from the (over-documented) salary, and, as we now know, his house in Wicklow, Delaney has seen his reputation in the European game flourish over the years. He’s now muscled his way in to UEFA - no doubt through being an nuisance, and be-friending the right people – and receives an overly generous EUR 160K a year (add another 100K for ‘expenses’) for his troubles. He’s a talented politician. And there’s no doubt, there’s been a trickle-down benefit to Irish football because of it (Europa League final, co-hosts of Euro 2020, and if you want to be exceedingly generous, 5M EUR for, eh, no good reason). His tenure has also proved incredibly fruitful to those around him too. The board owe him their careers (or, at the very least, the longevity of them) and, in return, all he requires is support, and it’s through this, that he has killed off many of the public finger-pointing throughout the years – After all, he “..continues to have the full backing of the board”. In order to digest exactly what has happened over the last 24 hours, all of this needs to be fed into the thinking. Specifically, what more personal value can Delaney derive from the CEO role? And it’s here where the rubber truly meets the road. So, whilst the country is led to believe the man has been dethroned, that the 100K loan was the one-step too far, Delaney has pivoted, and, I’m guessing, is not all that miffed. It’s no secret that for years now he has had his eyes firmly on the full-time UEFA gig, and with one foot in the door there already, his focus is less on Brand Delaney Ireland, and more on Brand Delaney Nyon. These headlines are a nuisance, and a threat to that ambition, and it’s for this very reason we have just seen one of the fastest, off-the-cuff, unplanned, unthought-through, restructures in Irish football history. Whether he can avoid the Oireachtas Committee hearing in a few week’s time, or not, remains to be seen, and lots of pertinent questions still need to be asked – both in relation to the bridging loan, and also this newly created role. Like why now, immediately after a qualifier, and 3 days before another? Why seek an injunction re: the bridging loan? How is that and this restructure connected? Why the need for a loan from the CEO in the first place? Is there no corporate governance at all? Why was there no access to banking loans? And why draw down early payment of Sport Ireland funding three years in a row? So many unanswered questions. But the most important question of all is surrounding the power of John Delaney in this newly formed role. That’s the core to all of this - and the answer has never been so clear. Whilst his political capital and ability to ‘work the system’ in Dublin has been diminished - Pat Hickey, Shane Ross, Denis O’Brien, John Treacy to name but a few who are no longer an phone-call away – his influence and command over the direction of the FAI is unquestionable. This is a move is not off the back of independent (that word again) governance advice in February, it’s a move directed and crafted by John Delaney, for John Delaney. And whilst in an ideal world he would no doubt want to hang around and cut the ribbon in 2020 when the Stadium Debt is paid off (although, he likely suspects he’s already lost the narrative on that one), and welcome his UEFA pals to Dublin’s finest culinary experiences during the Euros – the noise rumbles louder and louder, and to what damage does another year bring for him? He’s much too smart to bet on this risk:reward seesaw. So, by creating this new role as Executive Vice President, Delaney now does what he does best in removing himself from the scene of the crime, all whilst keeping a ‘title’ that allows him to continue his duties with the Executive Committee of UEFA – he is all but fermenting the structures he needs to catapult himself towards his next UEFA endeavour. And so, whilst all of us held our breaths yesterday; thinking our day had finally come – little did we know, the fools we once were, remain the fools we are today. But one fact remains to cling our hope on – there’s never smoke without fire. Delaney is in trouble, and he is clearly rattled by whatever this story can unearth. The panicked restructure, the multiple press releases, the mysterious new role, the whistleblowers, the ex-wife and her legal team, the not confiscating of flags (ok, possibly stretching it). But this 100K loan is a surface story with a darkened background, and what’s certain is we’re yet to hit oil. Is this purely the keys to unearthing a governance-inept organisation? Or do the whispers of more sinister and incriminating practices threaten? Only time will tell, but right now it’s a three horse race to the finish; Delaney, his FAI crony’s, and legal team – laser-focused on hiding and protecting him (again); the media, who have the story you feel, but battle with the ‘enough evidence to convict and publish?’ conundrum; and a increasingly interested Oireachtas Committee, led from the front by Noel Rock. Meanwhile us fans, stand by, waiting in hope that this will be the moment where the truth will come to the fore. Where Irish football will finally prevail as the most important party in Abbotstown. Where wrong’s will be put right, where lies will be put true, and where our one great ask beyond putting ‘em under preshah triumphs – transparency. In the meantime, how much will the Executive Vice President get paid? For what it’s worth, I’m willing to bet around 200K. As, when added to his UEFA packet, only John Delaney could demote himself, get out of the headlights, lessen his workload, rid himself of the League of Ireland ‘headache’, enhance his involvement with UEFA, lessen his legal bills, and still maintain his power and earn about the same. His time is well up.